only one ruler at a time. 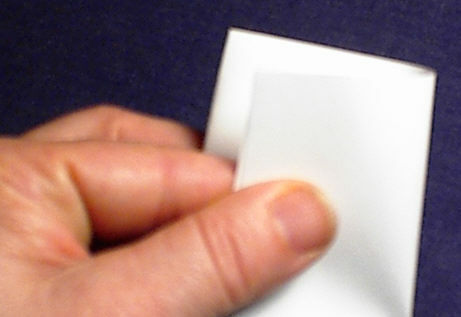 a 1/2" strip to produce an 8" by 11" sheet of paper. fold the paper in half and in half again so the top edge is folded in quarters. 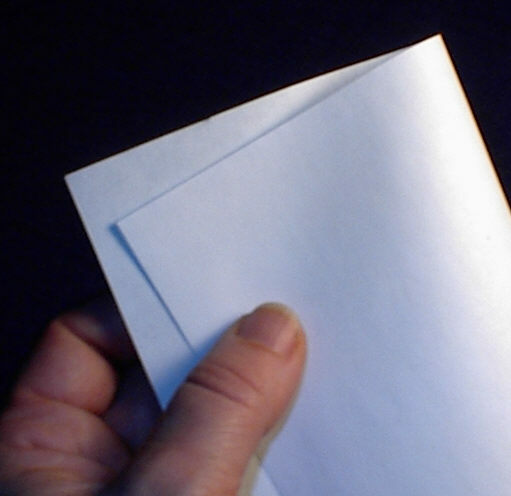 2nd: Open the paper up so it is no longer folded. With a pencil mark the creases. 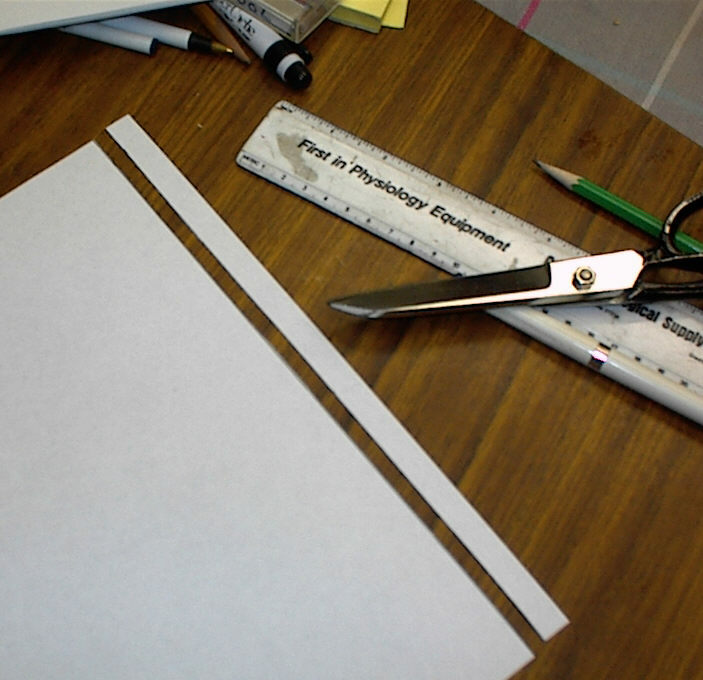 3rd: Create the areas of the paper in which to place the rulers. 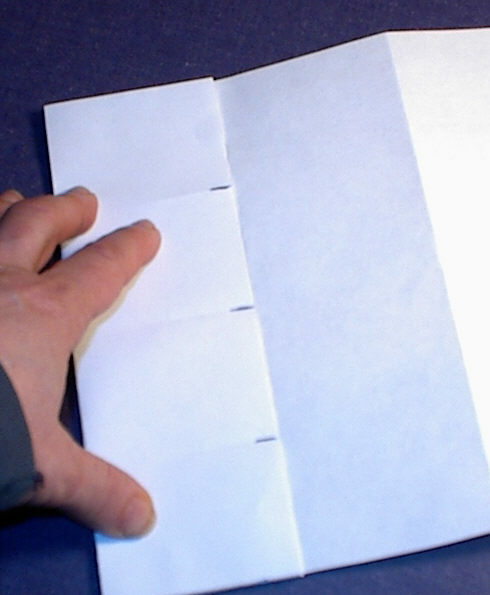 Do this by folding the paper widthwise in half and in half again to make a paper folded in quarters. 4th: Use the pencil marks to mark units on future rulers. the missing inch markers. Label each inch marker with a number. 6th: The inch ruler is complete. 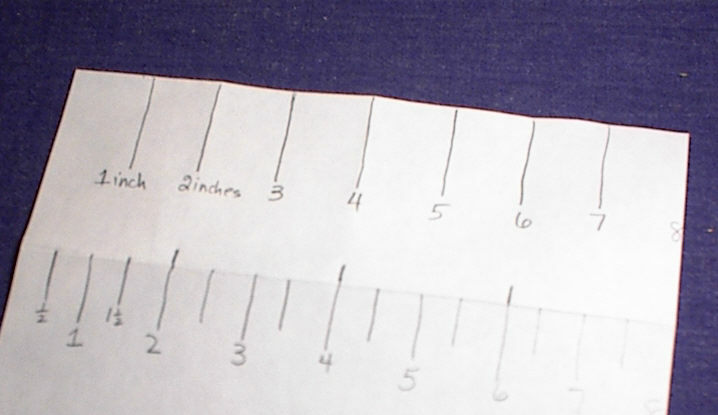 Redraw all of this ruler in the second ruler position. 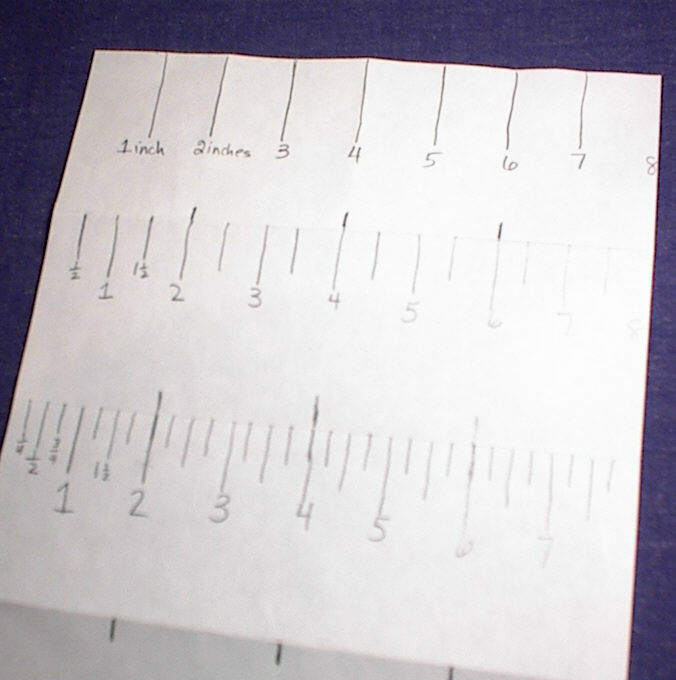 Estimate and mark the half-inch marks USING MARKS OF EQUAL HEIGHT BUT SHORTER THAN THE INCH MARKS. 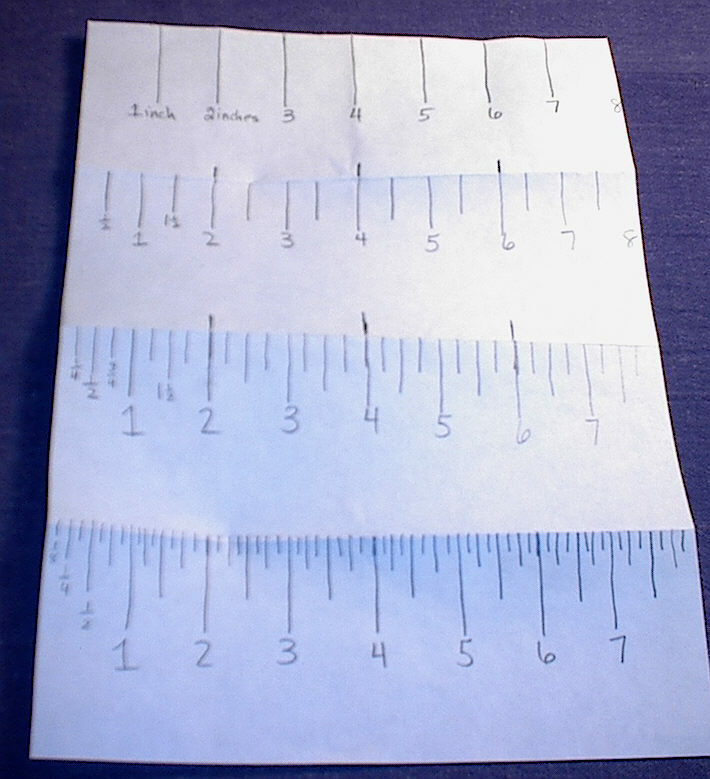 7th: The half-inch ruler is complete. 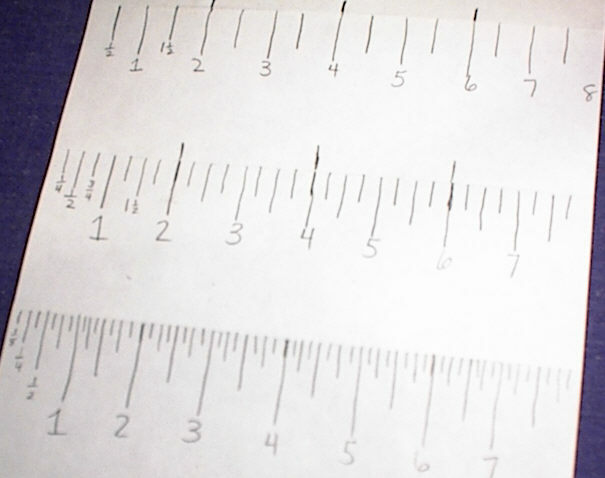 Redraw all of this ruler in the third ruler position. Estimate and mark the quarter-inch marks USING MARKS EQUAL IN HEIGHT BUT SHORTER THAN THE HALF-INCH MARKS. 8th: The quarter-inch ruler is complete. Redraw all of this ruler in the last ruler position. Estimate and mark the eighth-inch marks USING MARKS EQUAL IN HEIGHT BUT SHORTER THAN THE QUARTER-INCH MARKS. 9th: All rulers are now ready for use. Fold the paper to display only the ruler you wish to use.